Considering I believe most protein powders on the market are little more than junk food – thanks to all the artificial additives – fake flavours, fake sugar, fake muscle man on the label, Vital Protein powder is one of the few brands I am happy to give my nutritionist tick of approval because it’s made from pea protein vs whey, contains no nasties and actually tastes great! So if you’re looking for a healthy & convenient breakfast option, this is the perfect way to get your morning (easy to digest) protein hit! check out my coconut, raw chocolate & banana smoothie for a great recipe idea. my question is can it be use ad replacement meal as well. 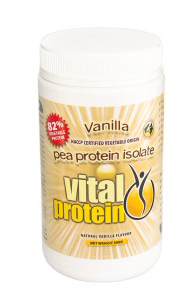 I’ve recently swapped to Vital Protein Vanilla from Protein FX Lo Carb powder. I am concerned about the high sodium level in Vital Protein. The serving sizes were different on the two labels so to compare apples with apples for 100g Vital has 425mg and Protein FX Lo Carb has 41mg. I’d love to hear your thoughts if you get a chance. I just bought this today. The lady at the health food shop said its a good protein for weight loss. Would you recommend it as a snack replacement, two shakes per day for loosing weight? Have been doing lots of searches online and came across living fuel brand of products, including living protein and super greens, its american based. Also ive come across synergy natural super greens. What do you think of these products compared with the vital products? Thank You for your fast reply 🙂 That information really helps, really appreciate it! Well there was alot going on but started 14 years ago with pcos, insulin/sugar issues but recently found out it may have been because ive been celiac/autoimmune disease all along. i now try to live a gluten, dairy and sugar free life (as these foods make me very ill) and now eat grass fed meats/organic (mainly turkey/chicken/ eggs) with lots of fruit n veggies including quinoa, millet gluten free grains. so hopefully both the rice and/or pea protein shake from vital greens should be ok for me. Yes unfortunately i dont think the source who told me about peas and fructose was a reliable source. i am really excited to have come across your webpage! i have asked about four different naturopaths and health advocates but for some reason, none of them have been able to give me a straight answer or know the answer. I am just wondering if the vital greens rice and pea protein are ok to drink if you are diabetic or fructose intolerant? as i know peas have a high level of fructose in them and rice is hi gi, so it might spike sugar levels? or do these proteins have a low level as it is mainly the protein extracted from the food? Also if someone is celiac and they have been recommended to eat no grains (paleo based diet) would you allow them to drink the rice protein shake? Hope my questions arent too much, Thanks for your time!! pea protein has a totally different molecular structure to soy, so you should not experience a reaction to it, in fact pea protein is a very low allergenic food, so I recommend giving it a go. The reason that you are experiencing the symptoms mentioned above – eg: developing a possible intolerance to certain foods after a week of intake – could stem from a couple of issues – 1) Depending on what foods you are consuming will influence how you feel – (or zombie like reactions as you describe 😉 – so you should start to keep a food diary each day for a month or so and note how you feel after eating a meal, this way you will hopefully see a pattern to associate these symptoms with. 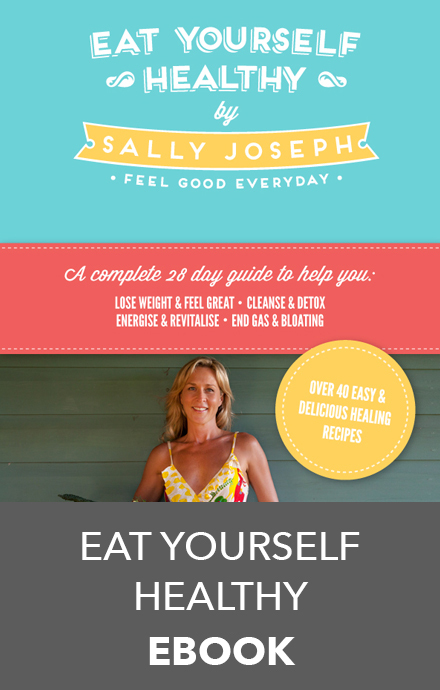 You may like to consult my e-book Eat Yourself Healthy In 28 days – http://www.www.flatseven.org/sallyjoseph/e-book/ as I provide a comprehensive food table detailing which foods you should avoid, moderate your intake of and those that get the green light – based on their allergenic factor, impact on the liver, sugar content and Candida producing factor, as well as recommended serving sizes and frequency of consumption. I am pretty new to all this and pretty keen to start getting more protein as I have started going to the gym to get my strength back and inprove my health (I am in IT). This explains a great deal and I am now doing great!!!! Just curious though, I eat muslie in the morning so switched to soy and did not do well at all… now I take rice milk, with this product as well. Is it possiable the “Pea” protein will be similar to the soy……? I find I can eat something feel great then a week of intake I am a zombie and have to discover what it is and wean off again. This is a real drag in an area where you have to think for a living. Long winded but I am very keen for supliment advice. I take vits and just started this product with Planet organic super 3. Feel great hopping it lasts! 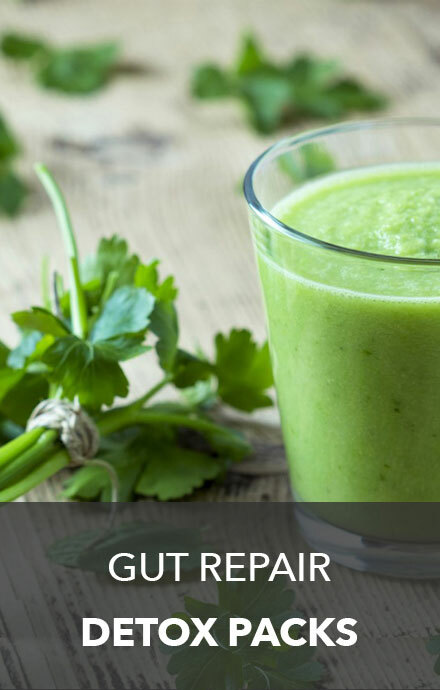 The Green powders are a great addition to your smoothies for added nutrition, I recommend the Vital Greens as its on eof the most comprehensive formulas I have seen, a desert spoon a day should do it! But you will need a meat cleaver style knife to open the coconut so not always practical! Yes – I use this too.I mix in banana and use rice milk (organic) to make a energy rich brekky! Although it can be quite a dense powdered drink.